Heat oven to 375°F. Spray large bakingcookie sheet with cooking spray. Unroll dough on work surface. Press into 12x9-inch rectangle. Firmly press perforations to seal. With pizza cutter or sharp knife, cut into 8 rows by 4 rows to make 32 squares. Cut Parmesan in 3 equally-sized pieces. Reserve 1 piece for grating. Cut remaining 2 pieces in 16 cubes each. Top each piece of crescent dough with 1 of the cubes of cheese, then roll dough into small ball around cheese; place seam side down on baking sheet. Place 10 balls in a single layer, clustered and touching together to form a round disk shape. Continue with a formation of 8 balls, then 6 balls, then 4 balls, 3 balls and finally a single ball. There will be a total of 6 disks (including the single ball), which will form the layers of the tree after baking. Bake 14 to 17 minutes or until golden brown. Cool on baking sheet 2 minutes. Meanwhile, finely grate remaining piece of cheese. Use large, flat spatula to transfer largest disk to serving platter or cake plate. Brush with pesto, and sprinkle with 1 tablespoon of the remaining Parmesan cheese, then top with next largest disk. Brush with pesto and sprinkle with 1 more tablespoon Parmesan cheese. Continue with remaining disks, ending with single ball. Brush any remaining pesto over tree. 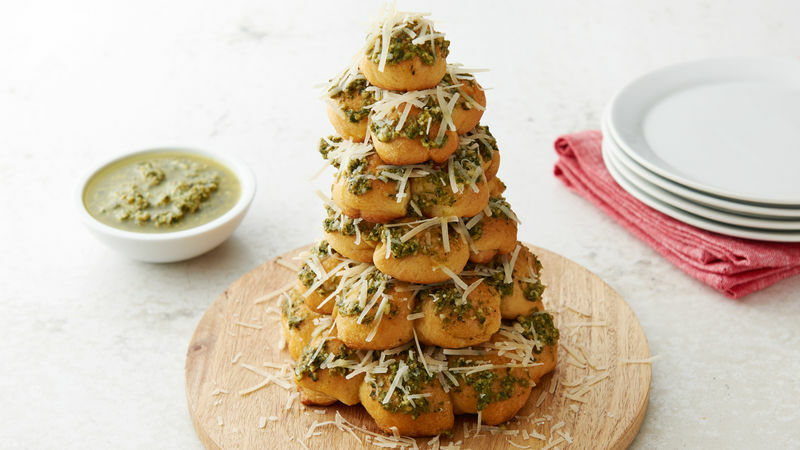 Sprinkle remaining Parmesan over tree. Serve with additional pesto, if desired. Have your own favourite pesto recipe? Feel free to use it instead of the packaged pesto. For a cute topper, cut a small star shape out of a red bell pepper, and place on top of tree, using toothpick if necessary.